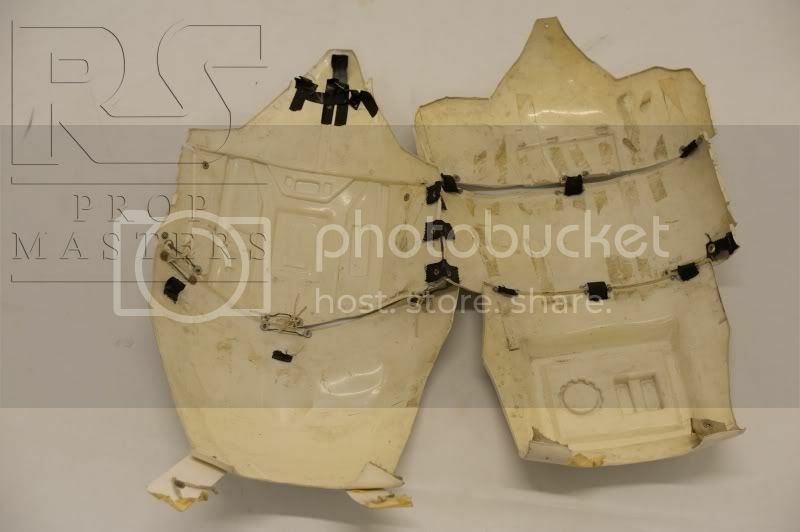 I doubt it if the picture TrooperMaster found is SiMan's kit. That one had an accurately painted helmet and the black details on the armor and hand guard. This one has no black details on the armor and hand guards, but it has an oddly painted helmet. To me that looks like a totally different set of armor. Sorry I meant the pic Nairod posted earlier in this thread of that ANH suit. I was glad Paul found it interesting as nobody else seemed to really be excited by it. To me it was a new ANH suit pic. I doubt it is Simons though but the black painted details on Simons suit were done by himself when he was a kid iirc. Still an awsome pic and yes probably 2 different suit between this one and that other pic Paul pointed out awhile ago. That ANH suit pic was posted some time back and I thought it was odd with the ammo belt being a different colour. Do not discount it as not being Simons suit so quickly just because it doesn't have the black marks. Simon admitted painting those on as a kid and I reckon that photo is early 80's, so it could still possibly be untouched at that time. Also, the suit did not always belong to Simon and it had to come from somewhere and could easily have been stolen from this exhibition. I am not saying that this suit is 100% Simons, but the fact that the whole suit looks to be painted and the belt is not, and the fact that is has the same doubled right arms is a strong possibility....is it not? Also, the hand plates worn upside down. I have never seen any hand plates like that in the movie. Yes, they are worn on the wrong hands, but never upside down. Another thing to note is that Simons suit has plastic hand plates which are simply cut out of a sheet of ABS and the details drawn on - they are not latex. It's a shame that we don't have a higher resolution photo to examine. 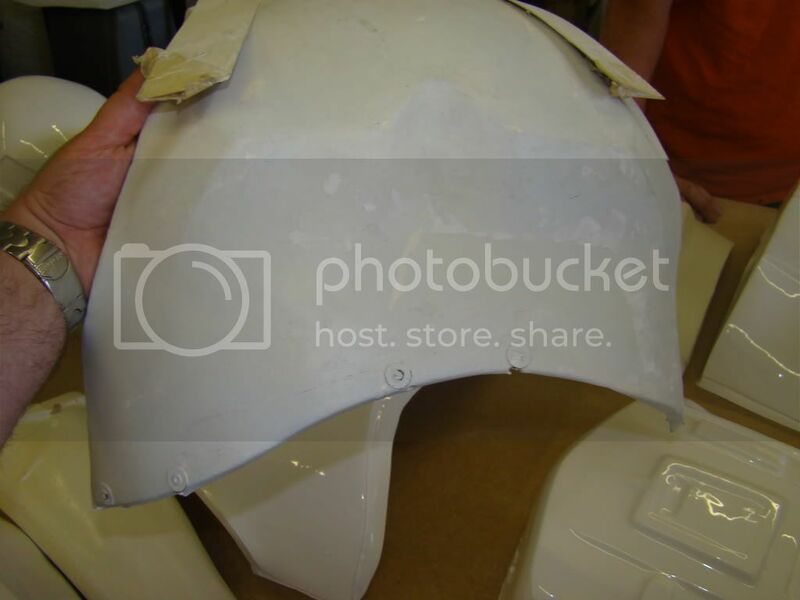 Who really knows what Simons helmet looked like before he stripped the paint off. Maybe it did have the strange frown as seen in this photo? I dug deep into my emails and found some photos from PIH that you might find interesting. 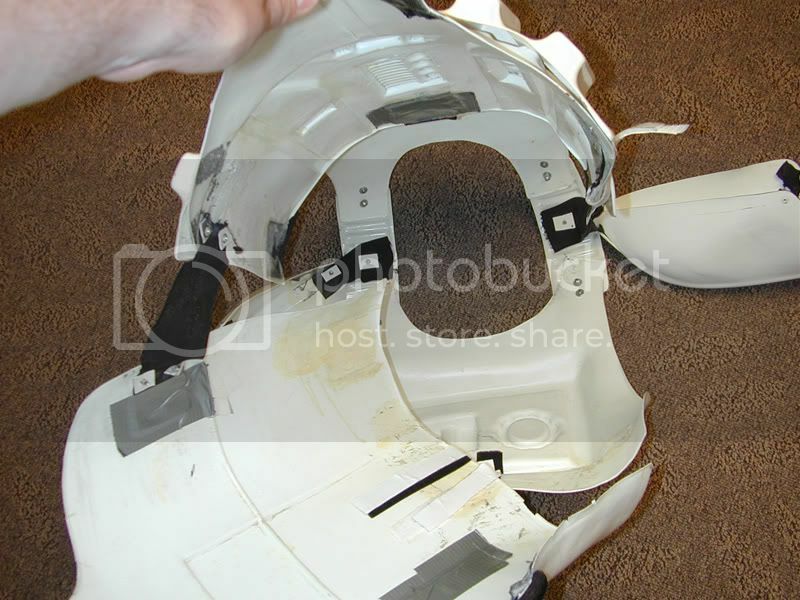 The helmet is clearly fibreglass and the armour ABS. Ah ok I get it now. I must have missed when that pic was first posted. I agree on all your points too.Yes it could have been Simons suit before he owned it. Sorry I meant the pic Nairod posted earlier in this thread of that ANH suit. Yes, that was the one I was commenting on. 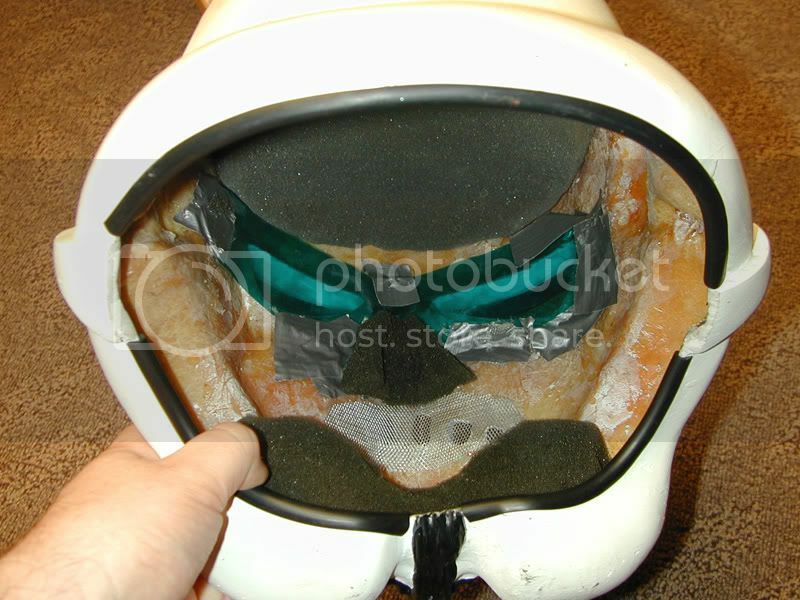 Well, the other picture you found that could be SiMan's suit, HAS the black markings on the armor and hand guards, but regular painted helmet. So... you can't have no black markings and oddly painted helmet and then later a picture with black markings and normal painted helmet and both be the same. That makes no sense. So... we have potentially two candidates that could be SiMan's suit... with more pictures it may be possible to narrow it down to one of them. But... they are not the same suits in those two pictures. Maybe they are the same suits with different helmets or maybe the same helmet was touched up again and corrected? No one knows the history of Simons suit before he got a hold of it, not even Simon, so anything is possible. It would be great if we could actually find Simons suit either on screen or in some of these rare photos. I still think the photo with the kids is the same suit and helmet though. The AHN suit in the photo was taken by me in 1983 at the Return of the Jedi exhibition in the toy kingdom at Harrods. I posted this on White Armour some time back. It was part of a large display of original Jedi costumes which inluding Vader with two imperial guards, Luke, Endor Leia, a couple of Skiff guards and a biker scount on a full size speeder bike. I was was taken by that the most as it really stood out. The stormtrooper was at the front of the exhit, so you could get up quite close to see it. I know I have another shot from the front of the whole suit, but I have had trouble finding it. My camera was not great at a the time, a typical point and click, so the phots are poor. I really must try and find a better scanner and get all the photos of the exhibit posted. Thanks for these informations mod! Since it's your photo, maybe you would like that I remove it. I don't remember to have found it on FISD..... but I have it in my hard disk since a long time. Sorry for delay getting back guys - been away. Very interesting information. The problem I have is that the suit Im looking at was receved by its owners in 1993 and IIRC thats BEFORE Joiner made his? I hope to see more and thanks for sharing!!! Cool.It may be something even beter then.I can`t wait to hear more. Please keep the photo up. I will endeavour to get a better scan done! I believe Joiners suits and helmets were made in 1996. If you need any info on them give me a PM and I can tell you what I know. 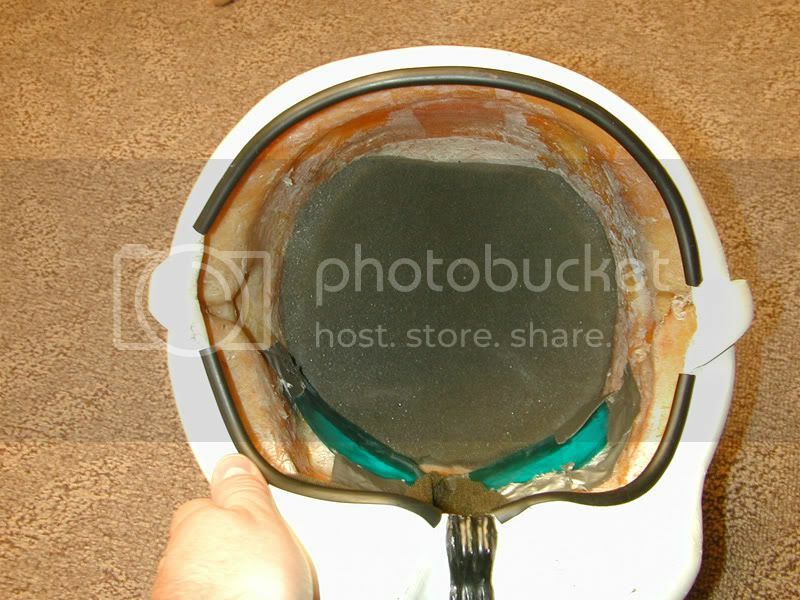 The pics of the fibreglass helmet were taken by a mate of mine who is friends with the guys who made the promotional suits for Joiner. A couple of casual observations that make me think this is not Simon's suit. The first is it looks like there are a couple of rivets on the canvas part of the belt on the left hand side (looking at the pic) of the plastic section part of the belt. The rivets appear to be holding the elastic part holding the drop box. On simon's belt the elastic is below the plastic part of the belt and the drop box is much further along - could be wrong though. The armour chest piece does not have rivets on the front like Simon's they are not visible. You know the ones that are normally on the lower rim of the chest piece that have torn through on Simon's. I would also say that Simon's rivets are identical to the ones on the ab plate below on the inside so I would say the replacements were probably replaced nearer the original production rather than 6 years later.